Dr. William J. James at 2010 S&T reception for the dedication of Staumanis-James Hall. Dr. William J. James, professor emeritus of chemistry, will share personal memories and compelling highlights of his 65-year academic career at Missouri S&T for the third annual Dr. James O. Stoffer Lecture. James’ lecture, “Anecdotes from the Lifetime Experiences of a 96-year-old Emeritus Professor of Chemistry,” will be held at 4:30 p.m. Monday, Oct. 8, in Room G-3 Schrenk Hall on the S&T campus. It is free and open to the public. Following the lecture, a reception honoring James will be held in the commons area on the third floor of Schrenk Hall. After the recruitment efforts of Dr. William Schrenk, a former Missouri S&T chemistry professor and the namesake of Schrenk Hall, James joined the chemistry and chemical engineering department at Missouri S&T in 1953 as assistant professor of chemistry. He had just completed his doctorate in chemistry and mathematics at Iowa State University. James’ research focus is crystallography and related chemical processes and properties involved in materials research such as electrochemistry and kinetics, X-ray and neutron diffraction, electrical and magnetic properties of solids, plasma-formed thin films, and polymer coatings. 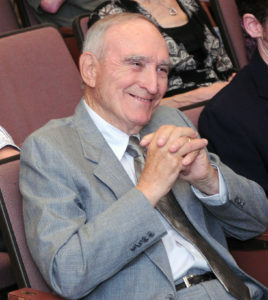 Dr. William J. James, Missouri S&T professor emeritus of chemistry. James played a key role in the formation of S&T’s doctoral program in chemical engineering and was advisor to the first recipient of that degree. In 1961, he was awarded a Fulbright Research Fellowship to study at the University of Grenoble, France and in the Neel Laboratory of Magnetism of the Center of Nuclear Studies, under the direction of professors E.F. Bertaut and L. Néel, Nobel laureate in physics. James helped establish Missouri S&T’s Graduate Center for Materials Research in 1964 and served as its director until 1975. That center, now known as the Materials Research Center, is housed in Straumanis-James Hall, a building that was renamed in 2010 to honor James and his colleague, Martin Straumanis, a metallurgical engineering professor who died in 1973. James and Straumanis are believed to be the first S&T researchers to receive funding from the National Science Foundation. James was one of the first S&T faculty members to start a company, Mead Technologies, based on the research of Dr. Larry Thompson of the Bell Labs, also a student of Dr. James. He also helped establish Brewer Science. He has received numerous awards including the Thomas Jefferson Award, the Missouri Academy of Science Most Distinguished Scientist Award and the Chancellor Medal. At 96, James continues to keep office hours in his namesake building, consulting with former students on research projects related to his crystallographic expertise. The lecture series established by Dr. James O. Stoffer, Missouri S&T Curators’ Distinguished Professor emeritus of chemistry, provides the campus and Rolla communities an opportunity to learn from scholars and innovators in the field of polymer chemistry and related areas. Stoffer joined S&T as assistant professor in 1963 and was instrumental to the development of S&T’s polymer chemistry program, one of the first in the United States to be accredited by the American Chemical Society. He taught organic and polymer chemistry to generations of young scholars, and was a five-time recipient of the university’s Outstanding Teacher Award and a three-time recipient of the Faculty Excellence Award. Stoffer served as director of the university’s Materials Research Center from 1992 to 2001. He authored scholarly papers on emerging methods in polymerization. Working with the late Dr. Thomas J. O’Keefe, Curators’ Distinguished Professor emeritus of metallurgical engineering and their students, his pioneering research led to the development of the first environmentally friendly alternative to the toxic, chromium-based anti-corrosion coatings used on military aircraft and on aluminum components in the aerospace industry. 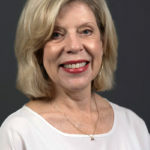 The lecture series was funded through a $50,000 gift from Stoffer. The funds are from royalties from Stoffer’s patent for the environmentally friendly chrome-free paint. S&T matched that gift with an additional $50,000 in patent royalties.